One can often go wrong while wearing monochrome outfits – especially when it’s an all white outfit. It’s definitely not easy to ace an all white ensemble without the support of another colour brightening it up. Looking dull or washed out thanks to the lack of some pop seems almost inevitable. White as a colour is not really associated with festivity or happiness – but you’re about to change your minds thanks to some of these fabulous Bollywood celebrities. 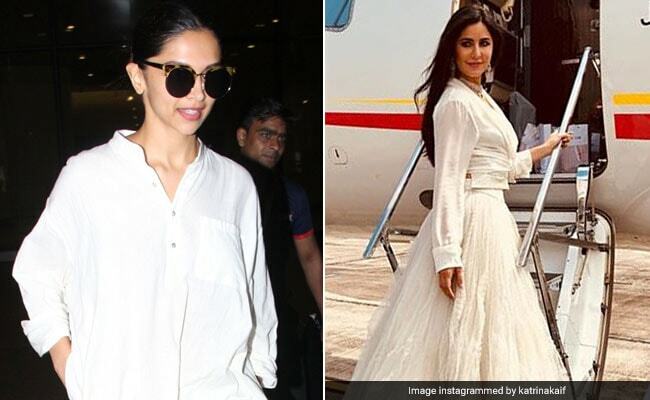 From Deepika Padukone to Katrina Kaif, these fashionistas have been wearing all white outfits and looking like a million bucks. Thanks to them, white now seems like the brightest colour (or non colour) there is. Deepika Padukone was recently spotted at the Mumbai airport wearing an oversized cotton shirt from Good Earth. She teamed the loose-fitted shirt with a straight fitted pair of white pants. Deepika absolutely aced the all white look by pairing the outfit with all tan accessories. She carried a deep tan leather bag and wore a pair of tan mules. Even the rim of her sunglasses was tan. Way to go, Deepika. Much like Deepika, Anushka Sharma always seems to be on the go – and the Pari star is no stranger to chic travel wear. A few days ago Anushka was spotted at the airport wearing a pair of crisp white, high-waisted trousers which she paired with a basic white t-shirt. White sneakers, a white and beige bag and a pair of round sunglasses completed Anushka’s look. Classic, if you ask us. Also spotted wearing an all white ensemble was none other than Dangal star, Fatima Sana Shaikh. On a recent visit to a restaurant in Mumbai, Fatima was spotted wearing a cream suit with white palazzo pants and a white dupatta. Festive enough? We think so. There’s no going wrong with a white cotton dress – and Kangana Ranaut knows this all too well. The Queen star was recently seen wearing a white cotton dress from Runaway Bicycle. Kangana paired this white number with white sandals that also featured a brown strap. Minimal colour, maximum style. That’s what we’re talking about. Katrina Kaif is always maxing the minimalism trend. Katrina manages to look resplendent and elegant no matter what she’s wearing. Earlier this month, Katrina shared a picture of herself in an all white lehenga set. Her ensemble featured a white wrap around top with some mirror work and a crinkled white skirt. Definitely adding some white outfits to our wedding wardrobes this season. Are you inspired enough to try a white on white outfit? We definitely are.